Captain Matt’s love of the water began at an early age, fishing the lakes and rivers of the North Woods in Wisconsin, Minnesota, and Illinois. But, once his parents sold the lake house in Wisconsin and purchased a houseboat in Key West, Florida, called the “Sassy Lady”, Matt discovered his love for the ocean. Spear fishing & lobstering, scuba diving and snorkeling became part of his daily life. Matt played soccer for the Key West High School Fighting Conchs and later in Oklahoma on a soccer scholarship; and still has a love for the game, today. Matt’s favorite off-time activities include reading and visiting with family, enjoying good food with good friends and anything outdoors. 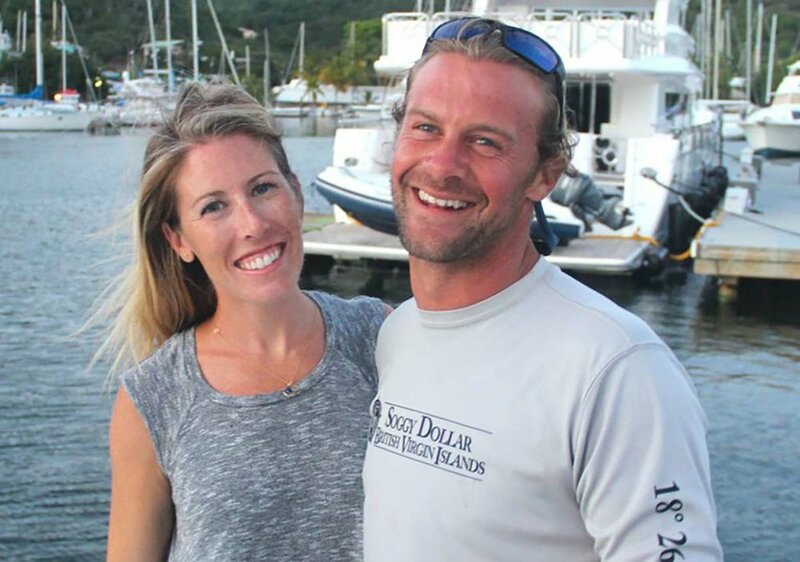 In October of 2014, Captain Matt moved to the Virgin Islands, the place his heart calls home. After working a year with the cruise ship excursion companies, he ran over 300 day charters on various center consoles searching out every nook, cranny, and cliff jump he could find. But, sailboats kept drawing him back in, until finally taking a position running a successful term charter boat with his girlfriend, Casey, who also has her Captains license and is an amazing chef to boot. Matt and Casey both enjoy exploring the area’s wildlife and history while hiking the many trails in the USVI National Parks. They enjoy starting each morning with self-guided yoga and love to stay active throughout the day. They are both very involved in their community and are a great resource for guests wanting to know more about the local culture and local fare. Casey Grimes knew she would find herself living on an island from the first time she visited the Caribbean with her parents. Casey grew up in Maryland and her love of the water began at age 4 when she learned how to water-ski on her Grandparent’s lake. Casey thrives off adventure and loves to embrace the beautiful island atmosphere (or unique culture?). Hiking, snorkeling, wake-boarding, paddle boarding and exploring new areas are all things she hopes to share with her charter guests. Casey received a Bachelor of Arts degree from the University of North Carolina at Wilmington. She has owned a boat for 10 years, and frequently found herself as Captain taking her friends to the nearby coastal islands. Casey moved further South to attend law school in Jacksonville, Florida. After 3 years in corporate America, she found herself working countless hours to make money but not having any time to enjoy life. In the summer of 2015, Casey made the decision to leave her corporate life behind and move to St. Thomas to help her family with their day charter business. Casey has a passion for cooking and exploring new cuisines, but she still loves to follow her grandma’s recipes for good old-fashioned comfort food. She admits to having a serious sweet tooth! When boat goes out as Captain Only with Matt, Casey has a home ashore to stay in. Soft drinks, sodas, water, beers & well drinks are available all day for your enjoyment.